If you have been following my Question of the Week posts, you may notice that this week I switched to a second person perspective when I asked the question. For example, last week I asked “What makes me laugh?” but this week I ask “How do you show up?”. This isn’t just a slip up on my part, but an intentional change. So last week I asked the question, What makes me laugh? Well, as most of my friends and colleagues can attest, it is not hard to get me to laugh. I think that life offers us so many opportunities for laughter and lightness and it is our responsibility to take notice whenever we can. I’m a deep belly laugher, a laugh so hard I cry laugher, a break into a coughing fit laugher…I LOVE to laugh. I love improv and comedy shows. My favorite skit is Robin Williams talking about how the Scots invented golf….it has some language for you sensitive types, but I’ve watched it hundreds of times and still cry with laughter…LOVE!!! Believe it or not, I’m a pretty serious and pensive person by nature and I have to remind myself to lighten up every now and again. I think I married my husband because he had this ability to make me laugh and diffuse any situation with just a few silly words. I feel immense joy when I make others laugh and try to find ways to do so at every turn. I really enjoyed my daily writing about what makes me laugh this week and hope you did too. Contemplating what makes me laugh got me thinking about how often we have to prepare ourselves to receive some of life’s biggest gifts. You have to show up ready to find lightness in what you are experiencing every day. It begs the question, how do you show up? How do you show up for meetings? How do you show up for relationships? How do you show up for clients? 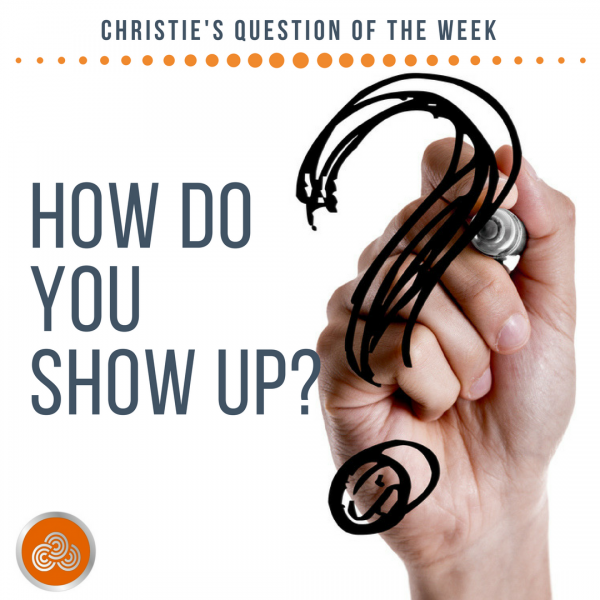 You know the drill: write down 3 ways you show up each day this week and share your findings with me. I’ll do the same and will see you again next Monday!